Check out this recent review of Eric's most recent album Free Hand!!! To see the original review, please visit this page. What would happen to you if one day there simply was no more music? Would you just miss it or would you quickly go insane? Whether you are a musician or just a fan, I think there are two kinds of people who are into music - those who enjoy it and those who couldn't possibly live without it. Guitarist Eric Loy definitely seems to be one of these "can't live without it" people. When I listen to Free Hand, I know that Eric has poured every ounce of himself into his music. He exposes everything - his life, his thoughts, his dreams, and his very soul on this album - and does it all without words. What a rare and beautiful thing. Now, anything without vocals generally loses a few points in my book - mainly because I find most instrumental albums to be repetitive and boring. I get lost in song after song that sounds the same and most instrumentals wind up becoming, at best, background noise. It's uncommon that an album like Free Hand floors me, but then again, I think Eric Loy is a rather uncommon musician. 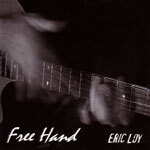 Most of the songs on Free Hand feature Loy's unique acoustic guitar style - complete with all sorts of percussive tapping and rhythmic thumping on the body of the guitar. Loy manages to run the gamut of styles here, including the bluegrass plucking of "Plow Hand" and the rocking "Mere Men." You'll also find elements of jazz, new age, country, funk, and more. These styles really take the listener on a ride of highs and lows, both physically and emotionally. Overall, through the use of so many styles, Free Hand ends up as a mixed bag and I think that is exactly what keeps the album interesting at every turn. Eric Loy also infuses his music with lightheartedness - another quality not often found in today's music scene where most take themselves way too seriously. Consider the frolicking romp of "Preposterous Rhinoceros," which sounds exactly like the animal looks, or the inclusion of the theme from Perry Mason. Even some of the song titles themselves are good for a chuckle, like "Guacamole Glove Box" and "Pancake Panache." Free Hand is one of those albums you really have to experience to appreciate. Guitar players and fans will be astounded by just how evocative this instrument can be in the hands of someone like Eric Loy. Couple that with the variety of styles present here and Loy's infectious personality that nearly drips from his music and you've got a thoroughly enjoyable album. Eric Loy is one of the world's undiscovered gems - and if you love guitar you'd be remiss in not checking him out.